Building stairs doesn't have to be difficult, but it does require precision and attention to detail. Whether your need is for a short flight of functional steps to a deck or front porch, or an interior staircase leading to a sleeping loft or mezzanine, the same basic principles apply. Measure the height of the flight from the first floor to the finished floor level of the second story. For outdoor steps, measure the distance from the porch or deck to ground level. Measure the length of the flight. To do that, you’ll need to be familiar with riser height and tread length. Consider the width of the staircase, usually a minimum of 36” for interiors. Find out whether a railing will be required. Handrails are only necessary on one side of a residential staircase. For exterior stairs, railings are often required when there are four or more steps. However, there are exceptions, so check with your local regulatory office for details. There are also some limiting factors: Safety needs and building codes address risers and treads in detail, and effectively prohibit the steep, narrow stairs common in historic homes. Riser height must generally be a minimum of 4” and a maximum of 7-3/4”, while the depth of the tread from back to front is required to be at least 10”, plus a "nose" on the front edge of between 1” and 1-1/4”. Riser height is allowed to vary only by 3/8 of an inch from one step to another, and tread depth must be consistent, as nearly equal as possible. Codes also address stairway width, head height, railings, banisters, and landings. The International Residential Building Code allows open risers–or "see through" steps–only if the openings "do not permit the passage of a 4-inch-diameter (102 mm) sphere." Always check local requirements before starting, because some jurisdictions have adopted different code provisions with varying requirements. Stairs in older homes were frequently steep and narrow; They were difficult to climb, and made moving furniture upstairs even more difficult. Many people find code-compliant 7-3/4 inch steps difficult. Older folks, young children, and pets all appreciate stair treads that measure at least 12” from front to back. With a 1-inch bullnose, the actual depth could be a generous 13" or 14”. 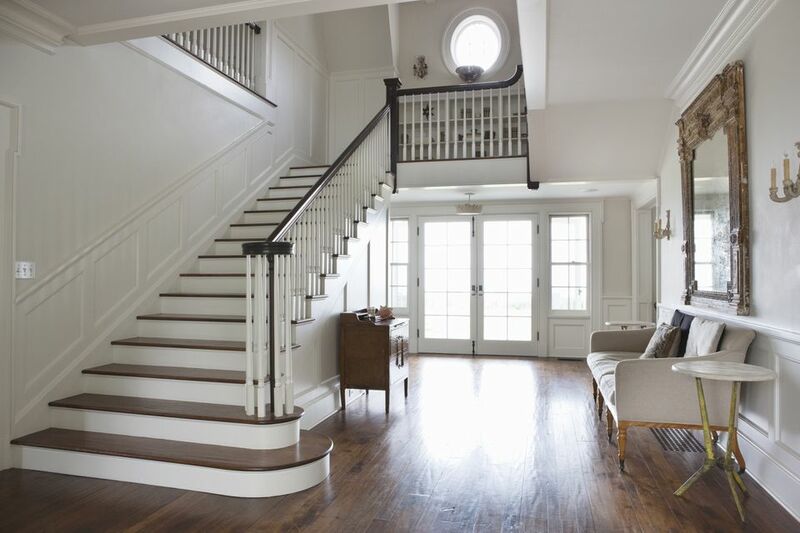 A rise of between 6" and 6-1/12” is both functional and comfortable for an interior staircase, but also requires more horizontal run, which equates to more square footage. Unless your stairs are poured concrete, the first need is for a sturdy support system. Wood "stringers," with cuts that look like a saw blade, are the most common. They are securely bolted to the bottom surface as well as the upper floor or deck level, forming the two outer edges of the staircase, and are usually constructed of 2x12 lumber. Wooden risers are attached to the stringers' vertical surfaces and then the treads are securely screwed to each horizontal level, forming what appears to be a stepped box. If the staircase will not be totally enclosed, sometimes straight edge supports replace the sawtooth stringer, and the horizontal treads are bolted to the supporting edges, or attached by slotted metal connectors for a modern industrial look. Second only to measuring, attention to detail is a vital requirement for stair-building. Finish materials affect the measurements: The tile thickness and setting materials, wood flooring or carpet and pad must be considered when planning the stairs. Having the surfacing materials on site before starting to build is smart. Weather-resistant redwood or cedar are ideal materials for outdoor stairs. Requiring minimum upkeep, they will naturally fade to gray, or may be stained or painted. Treated lumber is more cost effective, and it too can be stained or painted, but may require periodic refinishing. Whether your planned staircase is traditional or modern in design, there are many interesting options and design solutions. Open staircases with no walls and artistic handrails have become extremely popular for contemporary homes, and combining industrial materials such as steel or wrought iron with wood produces beautiful, strong, functional staircases. Open tread stairs, without a solid wood riser, are trendy, and modern treads can be anything from exotic wood to clear, thick acrylic. Building any set of stairs, even if it's only a two-step from the patio to the garden, involves detailed planning. Once you finalize your plans, the only requirement is to be diligent about the calculations so that the finished design is functional, attractive, durable, and safe.